The concrete ship sounds like it belongs to the same class of object as the chocolate teapot. i.e. Useless. And yet there's a part of the Thames where you can see 16 of the vessels lying on the foreshore. 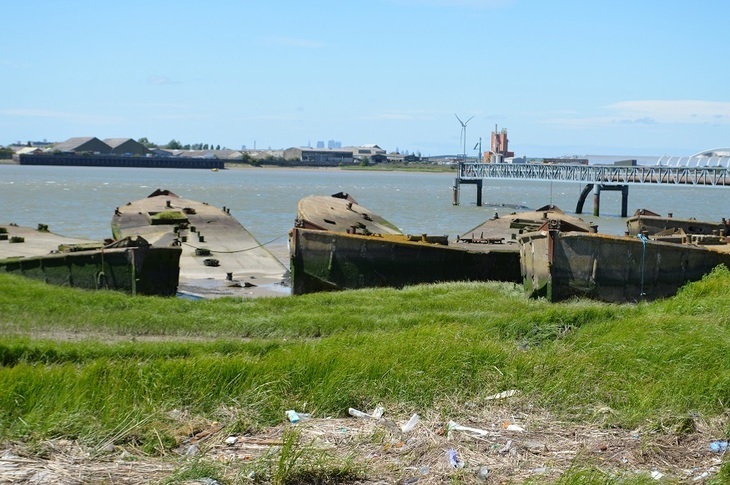 Head down to the riverfront at Rainham Marshes and you'll spy what, at first blush, looks like a pod of beached whales. Satellite view from Google Maps. 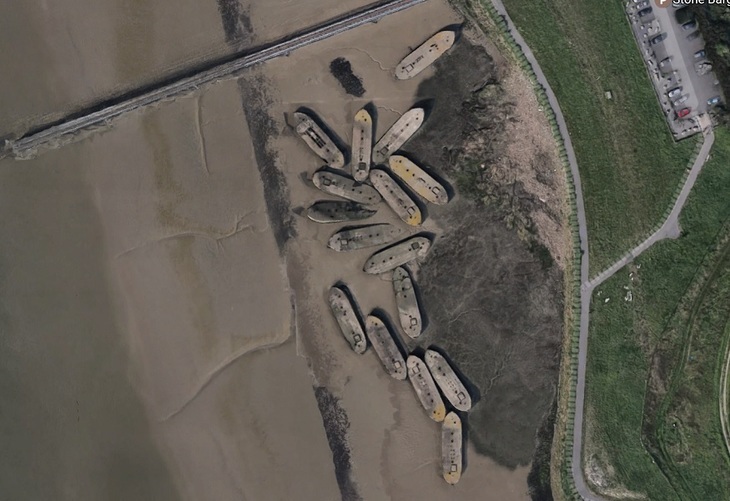 These hulking objects are, in fact, the remains of concrete ships from the second world war. To be clear: not ships for transporting concrete, but ships made from concrete. Dozens were constructed as part of the preparations for D-Day. Their hulls are formed from ferroconcrete — concrete reinforced with iron — a material that was relatively cheap to produce during wartime metal shortages. Despite appearances, they are lighter than the water they displace, and so can float. The barges played a key, if poorly documented, role in the Normandy invasion of June 1944. They were used to transport fuel to other ships engaged in the invasion, and may have formed parts of the Mulberry harbours and pontoon bridges that helped move men and equipment to the shore. Most of the concrete ships are long lost in the English Channel. 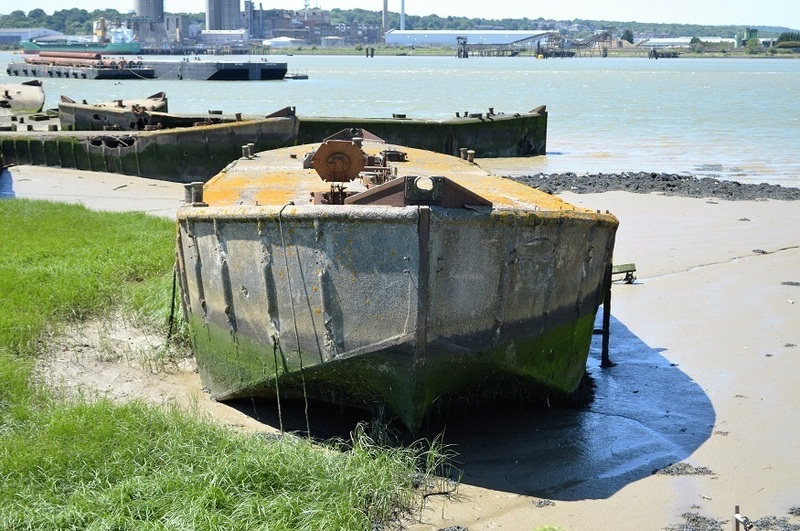 These particular hulks were reportedly given a new lease of life in 1953, when they were towed back to the Thames and sunk, to shore up damaged flood barriers. They've sat here in the mud ever since, slowly rotting away as the tides wash over. According to the RSPB, they now support another invasion: the annual wintering of rock and water pipits, as well as roost sites for other birds. 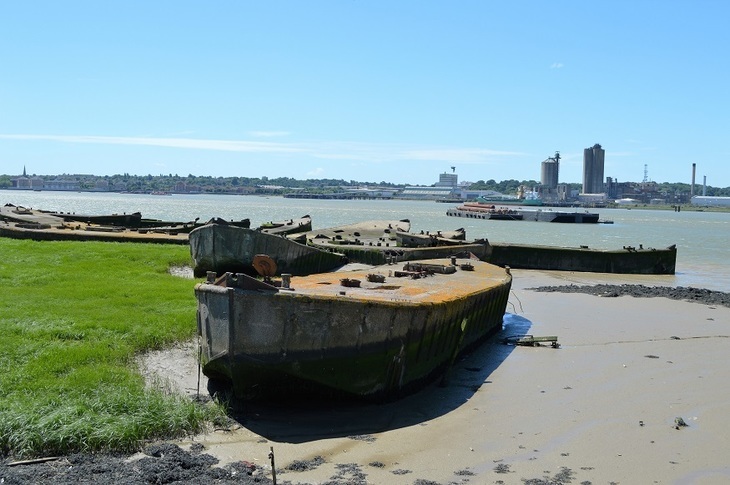 To see the concrete ships, tackle the five-mile section 24 of the London LOOP between Rainham and Purfleet. The Stone Barges car park is also nearby if you'd rather drive. Alternatively, contact guide Rob Smith who conducts the most fascinating tours along lesser-known parts of the industrial Thames, including here.